THURSDAY, Feb. 1, 2018 (HealthDay News) — You may not want to sit down for this. New research finds the mere act of standing burns more calories over time compared to sitting, and anyone bent on weight loss may want to remain upright a few more hours each day. 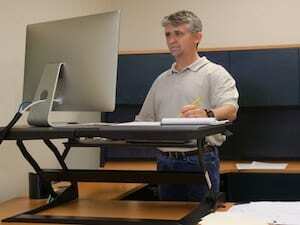 In fact, standing for six hours each day — at a ‘standing desk’ at the office, for example — could help you shed more than five pounds in one year, the new study found. Even though the notion of standing instead of sitting for a few more hours per day might seem daunting, “for the person who sits for 12 hours a day, cutting sitting time to half would give great benefits,” said study author Dr. Francisco Lopez-Jimenez. He’s chair of preventive cardiology at the Mayo Clinic in Rochester, Minn.
One cardiologist who read over the findings agreed. Numerous recent studies have found that sitting for long periods of time has been linked to a slew of health issues. And according to the Mayo researchers, the typical American now sits for more than seven hours each day. What happens when people leave their chairs and sofas behind? To find out, Lopez-Jimenez’ team looked at data from 46 studies involving a total of nearly 1,200 people. These studies compared how many calories people burned while sitting with the number of calories they burned while standing. The participants included in the studies averaged 33 years of age, 60 percent were men and the average weight of the volunteers was about 143 pounds. The study found that standing burns an extra 0.15 calories per minute compared to sitting. That might not seem like much, but it adds up over time. For example, after six hours of standing, a 143-pound adult would have burned an additional 54 calories. And if they didn’t increase their food intake, six hours of daily standing would result in a loss of 5.5 pounds in one year — or 22 pounds in four years, the research team estimated. The weight-loss benefits of standing might even be bigger than the study showed, Lopez-Jimenez said. “Our results might be an underestimate because when people stand they tend to make spontaneous movements like shifting weight or swaying from one foot to another, taking small steps forward and back. People may even be more likely to walk to the filing cabinet or trash bin,” he said. There were differences between people — men tended to burn more calories than women while standing, for example. That’s probably because people with more muscle mass burn more calories while standing. But Supariwala said it’s often tough to get overweight, sedentary heart patients to get moving. Recommendations to sit less and stand more, or to incorporate movement into their everyday lives — things like getting a pedometer to monitor their daily “step count,” or find a daily “walking partner” — can go a long way to getting healthier, he said.